I have an admission to make. Even though I write about storage a lot (want to keep your friends happy while moving? ), I’m not actually a storage unit. Don’t turn around… please… come back. Because I need to get this off my chest. I’m actually… ::sigh:: …a teacher. And this year, I moved classrooms and switched subjects, so I had to pack up and move. Now, I’ve moved houses before and this was nowhere near as complex. My principal pointed to a room, told me that’s where I would be, then I went through everything that I had not thrown away for five years, put stuff in boxes, and sent students down to the new room with those boxes. Then I unpacked the boxes, left for the summer, and that was that. But going through five years of stuff does make you think about what’s really important, what’s junk, and what’s just plain odd. And what I realized is that teachers have a ton of stuff. Additionally, we have some of that stuff in huge quantities. And, finally, some of that stuff is really weird. Plus, a couple of weeks ago, I read this hilarious post about professional development at schools. Go read that post, then come back to finish this one. I’ll wait. How great was that, right? A LOT of binders. When I switched classrooms, I threw out about 30 binders, all filled with stuff that I hadn’t looked at in years. It had all been graded, returned, and then left in my room. Why had I kept it? Presumably, I was waiting for that golden moment when I would need an example of an assignment and the light bulb would go off in my head and I would stride purposefully towards the shelf and reach out and grab the unlabeled binder from the shelf and flip to the right page and a student’s view of the world would change and these things never, ever happen. Ever. So, it’s safe to say that I wasn’t going to pull out the perfect binder right when needed. But it’s not just the full binders filled with student work that I found so interesting. I had a 4-inch binder filled with the curriculum for a class that I hadn’t taught in years, and that the district had eliminated. I had professional development binders from conferences and meetings that I had completely forgotten about. 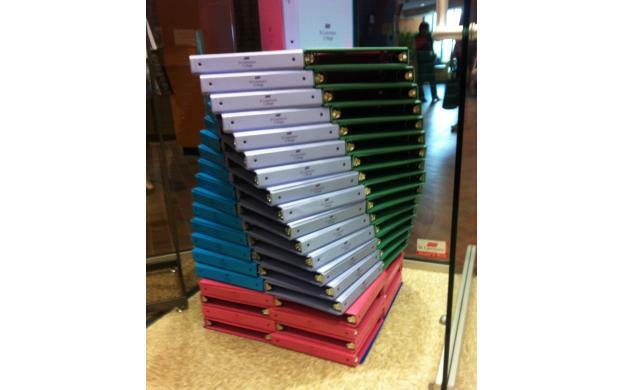 And my favorite was the 40 empty binders that were on my shelf. Empty. Nothing. I kept them to give out to students who couldn’t afford binders or who had problems at home that kept them from getting what they needed. And I used some of them for that. But, apparently I expected there to be a rush on families that couldn’t afford binders. That rush never came. I kept about five. I’ll throw them out when I retire. We could probably fill an entire mini-storage unit with staples that don’t fit any stapler made in the last twenty years. Until I started teaching, I had no clue how many different types of staples there were. I was pretty sure that there were three types: staples for desktop staplers, staples for staple guns, and staples for tummy tucks. I had never encountered the third type, but I was confident that they existed. Regardless, at this very moment, I have three different boxes of staples in my desk. All of them say “standard staples.” All of them declare that they “fit all standard staples.” Two of them are actually made by the same company. None of them are alike. Can’t Bostitch decide what staples constitute standard staples? At least internally? Don’t people at Swingline actually use staplers? Or are they all closeted paper clip devotees? Has anyone ever seen one of these maps anywhere other than in a classroom? In my classroom, I have three of them. But, one of those rollers actually has about twelve different map options. Seriously, I honestly can not remember EVER seeing a roll-up map anywhere other than a classroom. One of my students asked me why I didn’t have a globe. All that I could think is, why would I need a globe when I have fourteen different maps available at a single pull? I taught eighth grade English for five years. So, when I moved out of my classroom, I had to stop and try to figure out what the hell all those glue sticks were doing there. Then, I remembered. My second year teaching English, I did one project that required glue. It was a terrible project. Well intentioned, but poorly designed. Three years later, I threw out a slew of dried up glue sticks. The worst part? There were two of them that were still good and I kept them. I don’t know why, but they’re with those five binders. I’m not sure why every teacher meeting and conference insists on giving out tote bags. Perhaps they come free when you order massive quantities of binders. What I do know is that I do not need tote bags. I used one when I was a water polo coach so that we could keep the team’s water bottles together. I can see where some people might need one or two, but can’t we just assume that all teachers past their third year have been offered all the totes they need? Maybe we could save three dollars on our conference registrations if we refuse the tote bag? When I was directed to my first classroom, I opened up a cabinet and out fell dozens of bulletin board borders of various patterns, colors, and sizes. When I was directed to my second classroom, I opened up a cabinet and out fell dozens of bulletin board borders of various patterns, colors, and sizes. When I was directed to my third classroom, I opened up a cabinet and ducked. Didn’t matter. Buried in borders. If I were really smart, I would have gone into business making and selling these things years ago. Apparently the demand for them is completely disconnected from the need. Instead I teach the conditional tense. “Thanks!” says the teacher. “I’ll just put it over here with the others!” The teacher is immediately killed by an avalanche of ceramic A+ mugs pouring from the cabinet. In my classroom, I have a SMARTBoard, digital projector, computer, docking station, document camera, and I have access to Flip cameras, personal response devices, and entire carts of laptops for students to use. Our school has wi-fi that’s open to the students. Student: Does it connect to the computer? Me: You just put something on it and you can see it on the wall. Student (puts book on it): I can’t see it. Student: I still can’t see it. 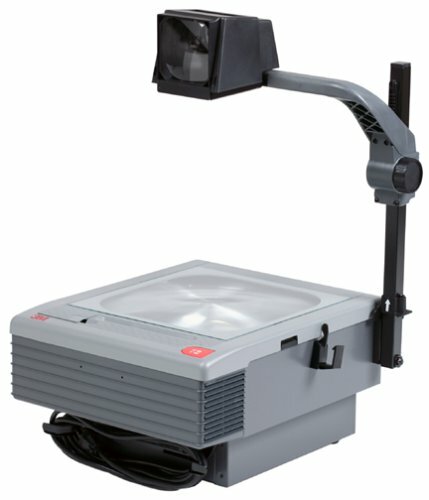 I’m pretty sure that explaining an overhead projector to my students would be similar to how my parents explained a party line to me. I can tell that it served a purpose at some point, but it seems almost hopelessly quaint and ineffective today. I teach 8th grade. Eighth graders are not adults, and sometimes they act like… well… children. Eighth grade boys excel in occasionally doing incredibly stupid things. I know this both from teaching and because I used to be an eighth grade boy and I did incredibly stupid things. To this day, there’s a substitute teacher who I really owe an apology. This causes me to worry about many things with my students. However, I do not worry when my students have scissors. They may be teenagers and prone to say and do weird things, but if you’ve ever seen a six foot tall offensive lineman try to use a pair of four-inch-long, dull metal scissors, you know what I mean. These kids are four years from being able to join the army, can’t we trust them with a pair of scissors? I did not count them. I did not care. Every teacher’s desk comes equipped with this key. This key does not lock or unlock the desk. Or the classroom. Or any file cabinet in a three hallway radius. Or a car, bike lock, safe deposit box, diary, or locket. This key is a deep dark mystery. To paraphrase an important book, many have speculated that if we knew exactly what that key unlocked we would know a lot more about the nature of the universe than we do now. Want to know about Russia? See: USSR. But life isn’t all orange roll-up garage doors. Sometimes, it’s about what ought to be hidden behind those doors. And if the day comes when you need one, we are happy to help. I could send you a pamphlet, but I can’t find any staples that fit in my damn stapler. This entry was posted in fun stuff, self storage and tagged classroom, school, st. louis, staples, teachers, technology by Ken. Bookmark the permalink. This is awesome! Especially the World Book encyclopedia. I’m sure your students don’t even know what those are. That’s the one thing on the list that isn’t actually in my classroom… you figured me out!